The Eastern Parkway stop of the IRT line is the one that takes you to the Brooklyn Museum of Art. 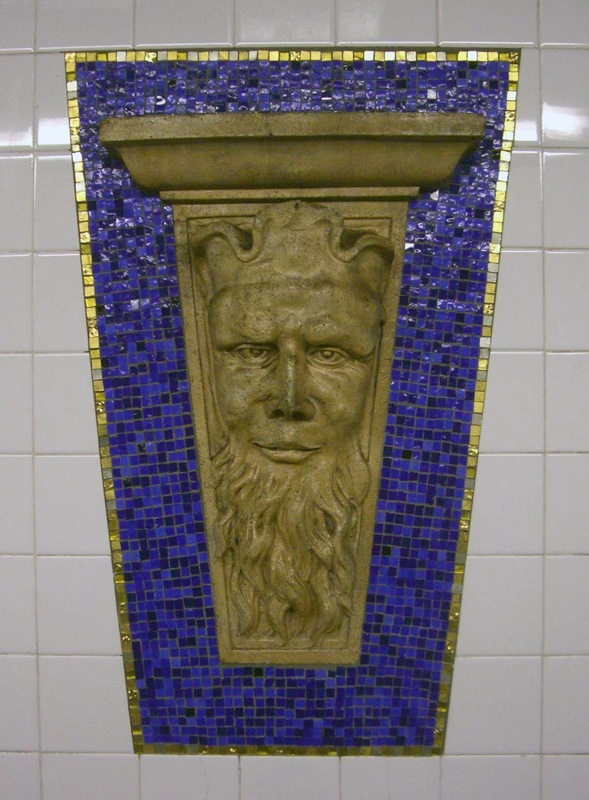 About ten years ago, when the station was renovated, the mezzanine became the setting for one of the transit authority's "Art For Transit" installations. The walls are studded with a series of architectural fragments salvaged from demolished buildings, part of the museum’s City of New York Collection. This head is one of my favorites. Carved into a keystone, his expression intrigues me. The curve of his lips makes him look slightly bemused but his eyes hold a bit of impatience in them. Did the stonemason model him after a real person? We will never know. Now he watches the comings and goings of commuters and still keeps his stony, unknowable thoughts to himself.